Viruses have a ubiquitous presence in the world. Their population is estimated to be 1031, 10 times greater than the nonillion (1030) of microbes on the planet—a figure that surpasses the number of stars in the Milky Way. Giant viruses are characterized by disproportionately large genomes and virions that house the viruses' genetic material. They can encode several genes potentially involved in protein biosynthesis, a unique feature which has led to diverging hypotheses about the origins of these viruses. 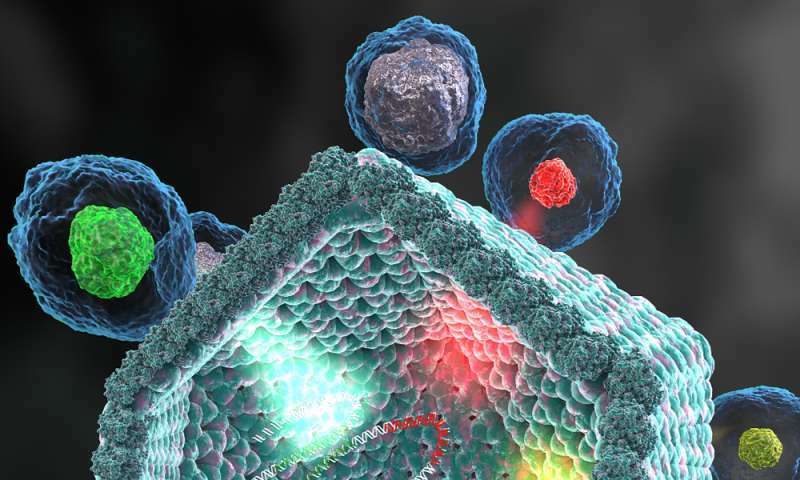 But after discovering a novel group of giant viruses with a more complete set of translation machinery genes than any other virus known to date, scientists at the U.S. Department of Energy Joint Genome Institute (DOE JGI), a DOE Office of Science User Facility, believe that this group (dubbed "Klosneuviruses") significantly increases our understanding of viral evolution. The predicted hosts for the Klosneuviruses are protists (single-celled eukaryotic (nucleus-containing) microorganisms) and while their direct impacts on protists are not yet worked out, these giant viruses are thought to have a large impact on these protists that help regulate the planet's biogeochemical cycles. DOE JGI published the findings in the journal Science on April 7, 2017 with collaborators from the National Institutes of Health, University of Vienna, and CalTech. "The discovery presents virus evolution for us in new ways, vastly expanding our understanding of how many essential host genes viruses can capture during their evolution," said National Institutes of Health evolutionary and computational biologist Eugene Koonin, a study co-author whose lab collaborated with DOE JGI on analyzing the Klosneuvirus genome. "Since protein synthesis is one of the most prominent hallmarks of cellular life, it shows that these new viruses are more 'cell-like' than any virus anyone has ever seen before." Scientists have been fascinated by giant viruses since 2003, when a group of French biologists led by Didier Raoult discovered the Mimiviruses. Since then, a handful of other giant virus groups have been found. The unique ability among them to encode proteins involved in translation (typically DNA to RNA to protein) piqued researchers' interests as to the origin of giant viruses. Since then, two evolutionary hypotheses have emerged. One posits that giant viruses evolved from an ancient cell, perhaps one from an extinct fourth domain of cellular life. Another—a scenario championed by Koonin—presents the idea that giant viruses arose from smaller viruses. The discovery of Klosneuvirus supports the latter idea, according to Tanja Woyke, DOE JGI Microbial Genomics Program lead and senior author of the paper. "In this scenario, a smaller virus infected different eukaryote hosts and picked up genes encoding translational machinery components from independent sources over long periods of time through piecemeal acquisition," she said. At first glance, the suite of "cellular" genes in Klosneuvirus seemed to have a common origin, but when analyzing them in detail, the research team observed they came from different hosts. From the evolutionary trees the team built, they noticed that they were acquired by the viruses bit by bit, at different stages in their evolution. The Klosneuvirus genes contained aminoacyl-tRNA (transfer ribonucleic acid) enzymes with specificity for 19 out of 20 amino acids, along with more than 20 tRNAs and an array of translation factors and tRNA modifying enzymes—an unprecedented finding among all viruses, including the previously known giant viruses. JGI postdoctoral researcher Frederik Schulz and Woyke unearthed Klosneuvirus while analyzing microcolony sequence data from a wastewater treatment plant sample in Klosterneuburg, Austria. 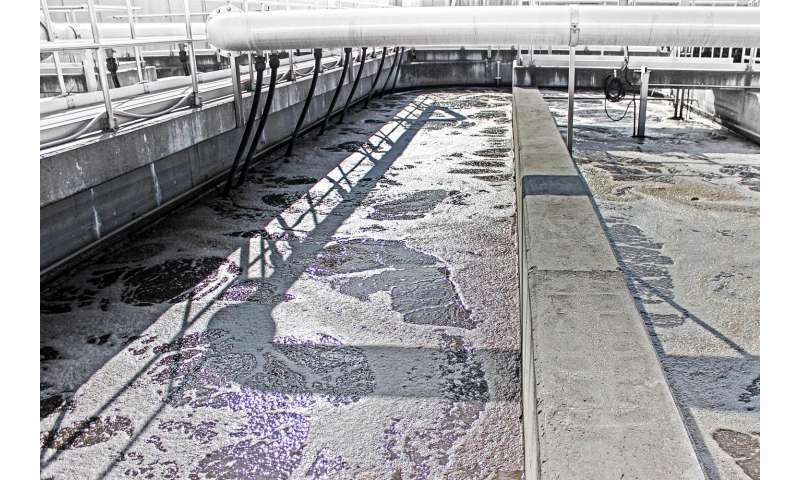 This data was generated under a DOE JGI Community Science Program (CSP) project focused on the diversity of nitrifying bacteria for converting ammonia to nitrate in industrial and sewage waste treatment. "We expected genome sequences of nitrifying bacteria in the microcolony sequence data," Woyke said. "Finding a giant virus genome took the project into a completely new and unexpected, yet very exciting direction." When Schulz, the study's first author, noticed that several of the metagenomes were viral in origin, he and Woyke conducted analyses to determine their source. They found that the Klosneuvirus group came from a novel viral lineage affiliated with Mimiviruses. "Mining sequence data in DOE JGI's Integrated Microbial Genomes & Microbiomes system, which houses thousands of metagenomes, allowed us to find evolutionary relatives of our Klosneuvirus," Schulz said. He notes that while the metagenomic discovery of Klosneuviruses helped answer important evolutionary questions, the actual biological function of the translation system genes remains elusive—at least until these viruses are grown in the laboratory together with their hosts. And Koonin believes there are more giant viruses waiting to be discovered in metagenomic data. "I'm quite confident that the current record of the genome size of giant viruses will be broken," he says. "We are going to see the real Goliaths of the giant virus world." Their population is estimated to be 10^31, 10 times greater than the nonillion (10^30) of microbes on the planet—a figure that surpasses the number of stars in the Milky Way. There are only roughly 10^11 stars in the milky way. I think that they meant to say "a figure that surpasses the number of stars in the known universe" which at ~~10^23 is still a considerable understatement.